Bears Discover Fire is our short film adapted from a short story called Bears Discover Fire about, well… bears discovering fire. The short story was written by American author Terry Bisson, published in 1990. It won a Hugo Award, a Nebula, the Asimov’s Reader Awards, and The Theodore Sturgeon Memorial Awards – amongst many others. I read the story for the first time in August of 2013 and immediately latched onto it. It’s a clever, charming tale that I personally relate to. The setting is one I’ve always seen very clearly, and the central conceit (bears discovering fire) seems so appropriate to my personal interests that I did a double take when I first saw it the title. I introduced the short story to my producer Scott Riehs, and we were off and running. 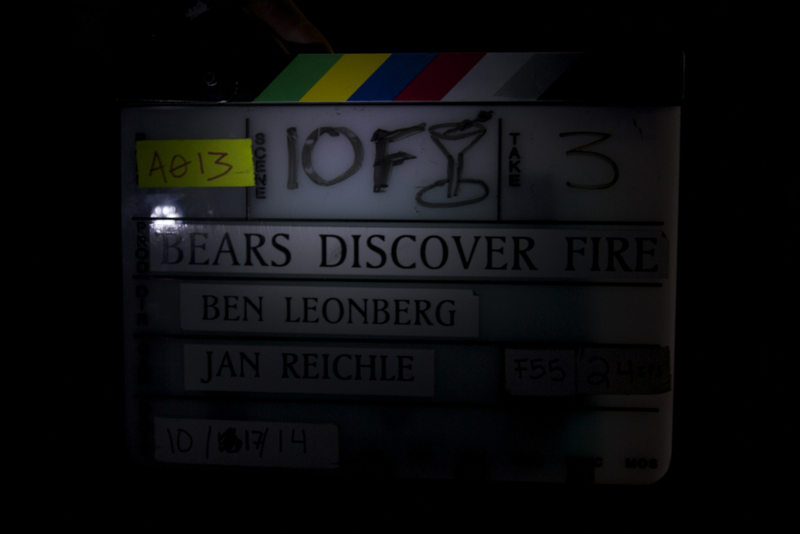 The production of Bears Discover Fire took place over eight days in and around Bridgeton, New Jersey in October 2014. At its most complex, the production employed a cast and crew of 57 individuals. Comprising this team were filmmakers, actors, puppeteers, artists, writers, and amazing designers and craftsmen. I had picked up our lead actor Daniel Butler (Uncle Bobby) from the Philadelphia International Airport the morning prior; we’d just spent the last 24 hours getting to know each other, exploring the film’s Deep South Jersey locations, and talking about Bears. Daniel is from Nashville, Tennessee. He’s a talented actor, an extremely hard worker, and always keen to make you laugh (an asset on any film set). This morning I met up with Daniel’s co-star Andrew Chamberlain of West Winsor New Jersey. Andrew plays the role of “Junior” – Uncle Bobby’s nephew – and although he’s just 14, Andrew is one of the most grounded and easy to work with actors I know. Casting kids is difficult; we were extremely lucky to find Andrew. Andrew’s focus and talent is up to par with Daniel, as well as Edith Ivey (our actress who plays Junior’s Grandmother and Uncle Bobby’s Mother). Combined, Daniel and Edith have over 150 more years of experience than Andrew. Not bad, Andrew. 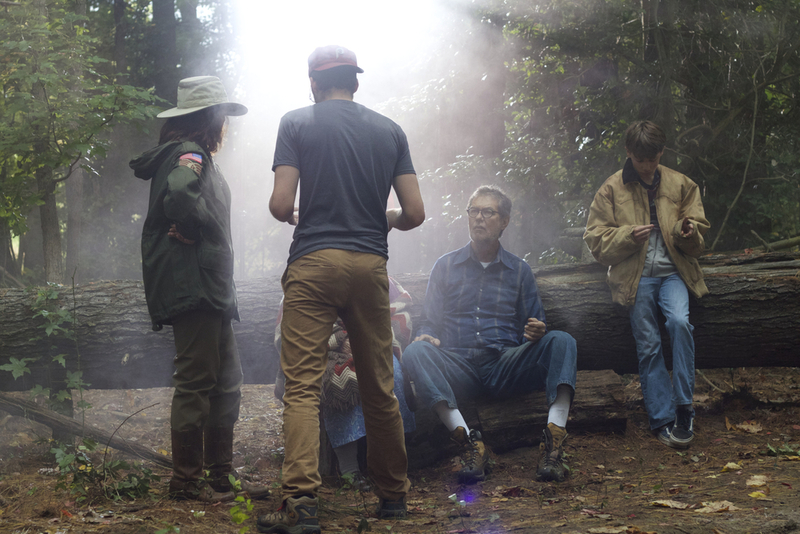 We rehearsed the entire film and visited each location we’d be shooting – a total of 18 scenes in 5 different locations. We also had time to plan some basic blocking and talk about the shots in mind. Blocking is physically figuring out where the actors stand and move during a scene. It can be tedious to figure out, and usually it all changes as soon as the camera comes into play. But the work we did today will save us hours of time later in the production. 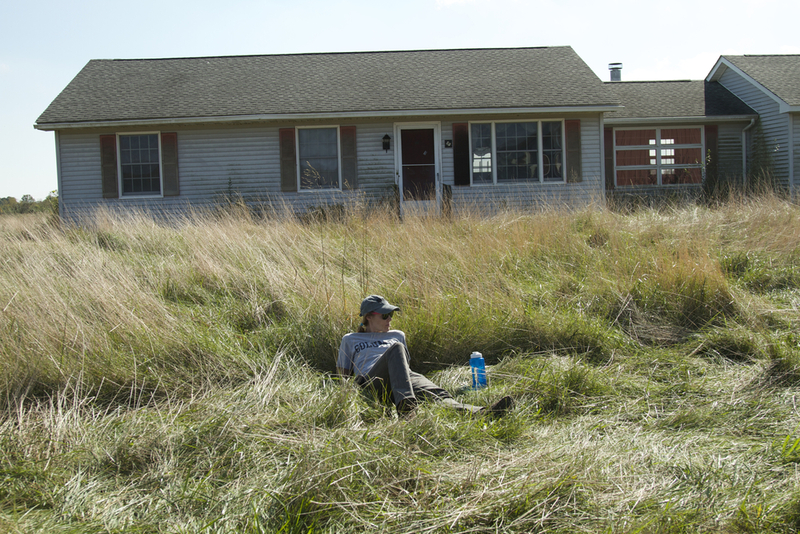 At the end of the day we started the process of moving into Eagle Manor – our home for the duration of production. Eagle Manor is a 23-room “Quaker-style” mansion on the bank of the Cohansey River. 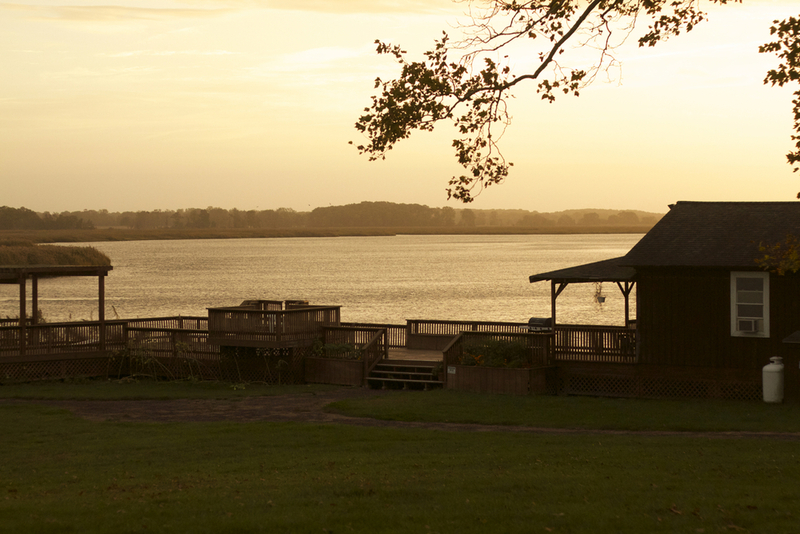 Owned by the state of New Jersey’s Fish and Wildlife Department, we secured a Special Uses permit to use the surrounding property and woodlands as our primary outdoor locations. The mansion itself will serve as our Nursing Home location, as well as our base of operations and lodging. Tonight: Daniel, Andrew, the Art Department, and the Grip & Electric team moved in. Tomorrow will be a big day of preparation – for later in the evening we’ll begin filming. Tonight is the first of three straight night shoots. In the film world, a working day is a full twelve hours. This means that for our first three days, work will start at sunset and end at sunrise – basically everyone has to reprogram themselves for the graveyard shift. For all of us already on set, we forced ourselves to sleep in and relax until the afternoon when the rest of our crew from NYC arrived. By 2pm the masses had descended upon Eagle Manor (32 people for this first night). A Cube truck of gear sat ready to go, the picture vehicle was ready, the camera was assembled, the bear was unfrozen (I’ll explain this later), and torches were ready to be lit. Now all we had to do was make the movie. This first scene is a doozy. It depicts an iconic moment lifted directly from the short story in which a bear holding a torch stumbles across Bobby and Junior while they are changing a flat tire. Afterward Bobby flatly utters the story’s famous line: “Well… looks like bears have discovered fire.” It was extremely important that we nail this scene -- in order to start things off with a bang, and to set the pace for the rest of production. For the final “looks like bears have discovered fire” moment, we mounted the camera onto the hood of our picture car (a picture car is a vehicle rented specifically for use in a film), and the car drove away from a bear holding a flaming torch. This all happened at night, so we lit the entire road with very large film lights. It was no small feat, but thanks to our tireless Grip and Electric team led by our Gaffer Nick Weiss-Richmond we pulled it off. The second night shoot has been even more complicated than the first. We traded in one bear for six bears, and a moving picture car for a roaring campfire. To make things even more difficult our location -- a cathedral-like clearing in the forest -- is far away from road access. So, we huffed our equipment deep into the woods instead of simply pulling it all out of the cube truck. Once again, Nick and his tireless G&E team managed this feat in fine fashion. 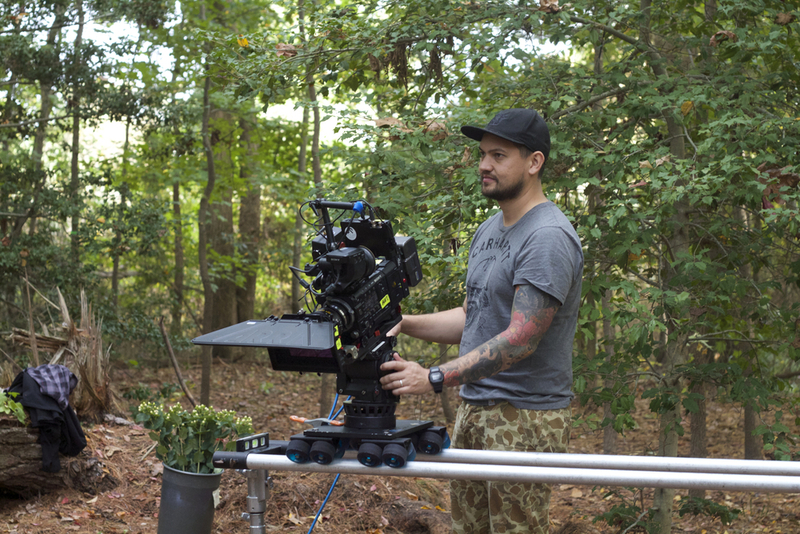 Earlier in the week I had cut a path to our location with the help of BJ Downs (our Technical Supervisor) and Ali Petre (our Production Designer), even though sawing a trail through the woods doesn’t usually fall into either of those departments. Here’s another way to describe the action: Bobby and Junior enter the clearing to find a group of bears sitting around a roaring campfire. Then Mother appears. She invites Bobby and Junior to join her with the bears. They walk over and sit down with with her. The bears observe the newcomers before going back to enjoying their campfire and doing bear-things. Pulling this off meant a lot of planning ahead. 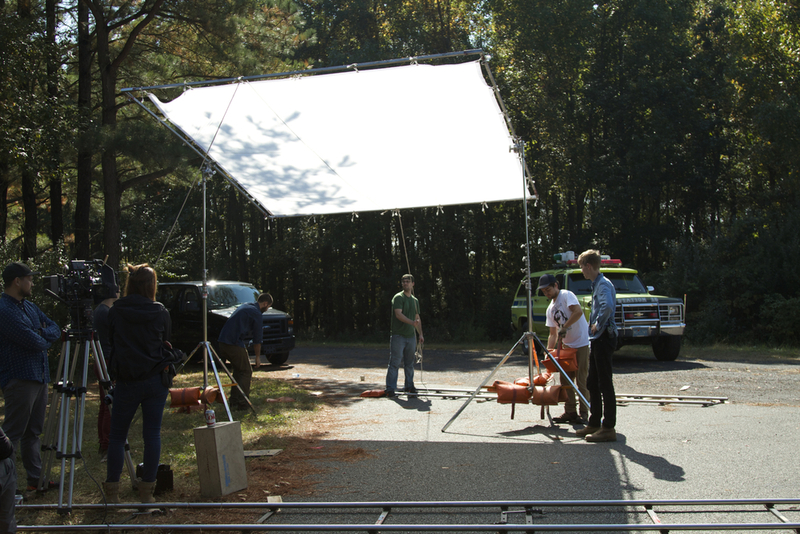 The human actors (Daniel, Andrew, and Edith) had a relatively straightforward task, so we started the day by setting Uncle Bobby, Junior, and Mother’s blocking while it was still light out. Next we worked out the blocking for the bears… and this is where things get complicated. We rehearsed the scene with our bear-performers out of their bear puppets, because once getting inside the bears, the puppeteers are effectively blind. This means that each bear performer would need a “bear wrangler” to help guide them around the set – which of course would soon contain a roaring campfire. The sun went down. Nick and G&E (grip and electric) were setting up lights throughout the forest while the bear performers began getting inside their puppets. This was no small task. It takes about 20 minutes to slip someone inside a bear suit — supplied by Matt Brady, our professional Extreme Animal Puppeteer extraordinaire. And once you’re inside the suit you can only stand it for about another 20 minutes before overheating and getting lightheaded by breathing in too much of your own CO2. So this is what it all means: In order to get the shot, we had to 1) finish lighting the forest, 2) finish prepping and placing all the Bears, 3) get the campfire burning the brightest, and 4) make sure the actors were ready to perform all at the exact same time. And we did. We managed to do six takes of what is (at the time of this writing) the most impressive shot I’ve ever been a part of. 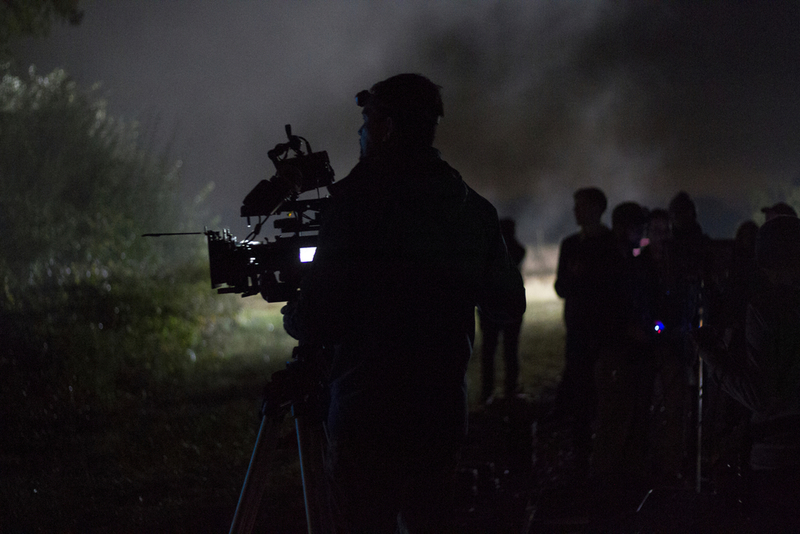 Tonight – our third night shoot in a row – has been our final shooting day with bears on set. It was also relatively less complex than the previous two nights… that said, we still had a bear puppet in-play and all of our night exterior lighting equipment to set up. In this scene Bobby and Junior have an unexpected and very close encounter with a bear. This was the first time that one of our bear puppets was getting a real close-up. Thankfully we had built our own “hero bear” specifically for this purpose, and thanks to the amazing taxidermy work of Chuck Testa our puppet is photorealistic. A little more about our bear: this guys is actually constructed out of real leather and fur which makes him much more realistic than his synthetic co-stars. But what we gained in realism we lost in mobility. Thankfully the puppeteers piloting our hero bear, John Riddleberger and Greg Manly, were fresh off the National Tour of the play War Horse and found many ways to bring this otherwise stiff puppet to life. I mentioned a little ways back that before shooting, our bear had to be defrosted. This is true. One of the disadvantages of our photorealistic bear is that its natural construction materials will degrade over time… unless we store it in a Han Solo-like deep freeze in a handy portable freezer. So as bizarre as it sounds, we froze and defrosted our lead bear every day between uses. The scene went great and the final shot (a tracking shot that follows a bear on all fours) through the forest was another knockout. After three “days” of night we had another three days of “day” left to shoot. But in order to get back on a normal sleep schedule the production had to take this day off and get some much-needed rest. Although we couldn’t entirely resist working; with a spectacular sunset coming, we decided to quickly pick-up one new shot of Bobby and Junior getting a flat tire (the flat they’re fixing when the bear first arrives). All said this was a restful and restorative day. No it wasn’t actually Mother’s day. This day has been all about “shooting out” the character Mother. In film you when you “shoot something out“ it means you’ve finished filming every shot that involves a certain element of the film. For example: we had finished shooting out the torch on Day 2 and then finished shooting out the bears on Day 4. Which means at that point in the week both our bear performers and pyro-technicians could go home to New York. At the end of Day 6 we would finish shooting out Bobby’s Mother. I mentioned earlier that Mother is played by the amazingly talented Edith Ivey. Edith is 84 years old and has been acting since she was 17 (her first TV role was on The Howdy Doody Show). She brings an amazing energy to set and her steadfast commitment to perfection wonderful. And I didn’t make it easy on Edith. In one scene Edith had to operate an electric wheelchair and hit blocking “marks” at specific times. This scene was also the first and only “oner” in the film, which is a single long take that sometimes covers all the action and dialogue of an entire scene. It was no small task, but we pulled it off. At this point, the production has become a well-oiled machine. Tim (the AD) gets everybody into position, Jan (the Director of Photography) sets the camera, Nick and his team manage the lights, and I talk to the actors. Meanwhile, Scott and the producing team make sure everything ran smoothly. 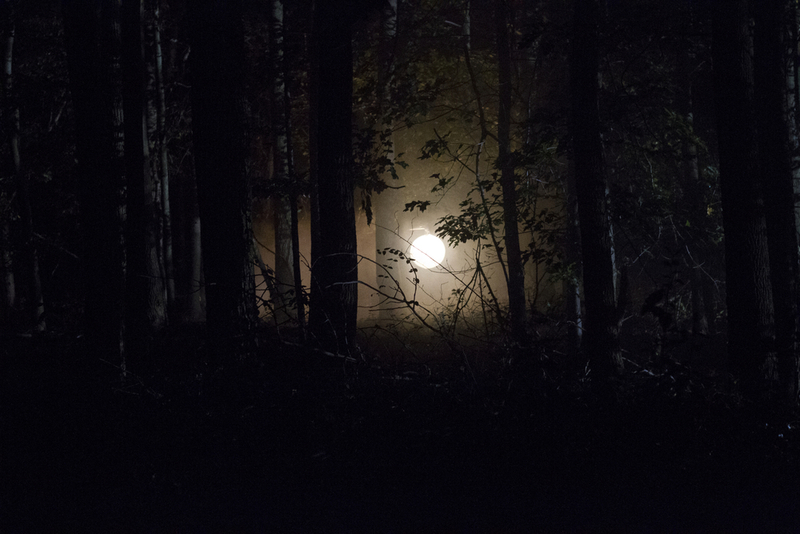 Day 7 has been a big one – we shot out Eagle Manor! Day 7 was also our Miracle Weather Day. The forecast called for rain and storms but somehow we ended up with sunshine and clear skies. After four days of campfires, bears, electric wheelchairs and night exteriors, things also got less complex for me as a director and for the actors. The scenes we still had left were all about Bobby and Junior’s relationship. The big set pieces had already been shot; now the scenes would focus on an uncle-nephew relationship and how it changes into something akin to father-and-son. After working and living together for six days at Eagle Manor, it was the best time for Daniel and Andrew to dig into these scenes. They were friends, and playing out these scenes was the time I felt the most relaxed on set. Filming was a breeze, but living in the Eagle Manor has gotten more and more complicated. The mansion hasn’t been lived in since 2006 and there had been several “home-care” problems that keep getting worse as the week wears on. The septic is tired, electricity doesn’t go on in half of the house, the kitchen sink is busted, and we’re down to two working bathrooms… thankfully this would be most of the crew’s last night at Eagle Manor. We had dubbed our final location the “Texas Barn” because it looked like a set from Friday Night Lights. On this, the final day of principle photography we had three scenes to shoot in order to finish the film. The Texas Barn served as Bobby’s home. In movie-geography the Texas Barn is just past the bend in the road where we had been filming for the last six days. In reality it was 10 miles away and in a different town. In order to cheat these two locations together we brought the gate with us from one location to the next so the same set piece would be seen in both locations. By establishing that the gate is at the bottom of Bobby's driveway we where able to glue these two entirely separate locations together. Our three scenes at the Texas Barn each took place in three distinct times of daylight: DAY, SUNSET, and NIGHT. This means we had to carefully schedule the day to make sure we didn’t accidentally cut into the daylight hours of another scene. We only had one day to shoot at the Texas Barn so the consequences of not making our day would be very bad. But despite the potential challenge this ended up being one of the easiest days on Bears Discover Fire. The team was a well-oiled machine and we ended production on a wonderful high note. Calling "THAT'S A WRAP" on Bears Discover Fire felt like completing some massive rite of passage. Scott and I had been working on the film for over a year, and at this point and nothing in the world could have felt better than finally getting the picture in the can. Many months of post-production lay ahead, but we had pulled off the shoot in fine fashion and I couldn't have been prouder of everyone involved. Thanks for reading the diary!